PISSARRO IN THE NEW BARNES MUSEUM IN PHILADELPHIA! Tucked in among the largest collection of Renoirs in the world andkeeping company with an enormous group of Cezannes is one painting by Camille Pissarro. Dr. Alfred C. Barnes, a medical doctor who made his fortune in the pharmaceutical industry, became interested in collecting the art of his time. According to the film at the Barnes Foundation, he sent his good friend and prominent Philadelphia artist (member of “The Eight”), William Glackens to Paris with $20,000 to buy paintings to begin his collection. This Pissarro was one of the 20 paintings that Glackens broughtback. 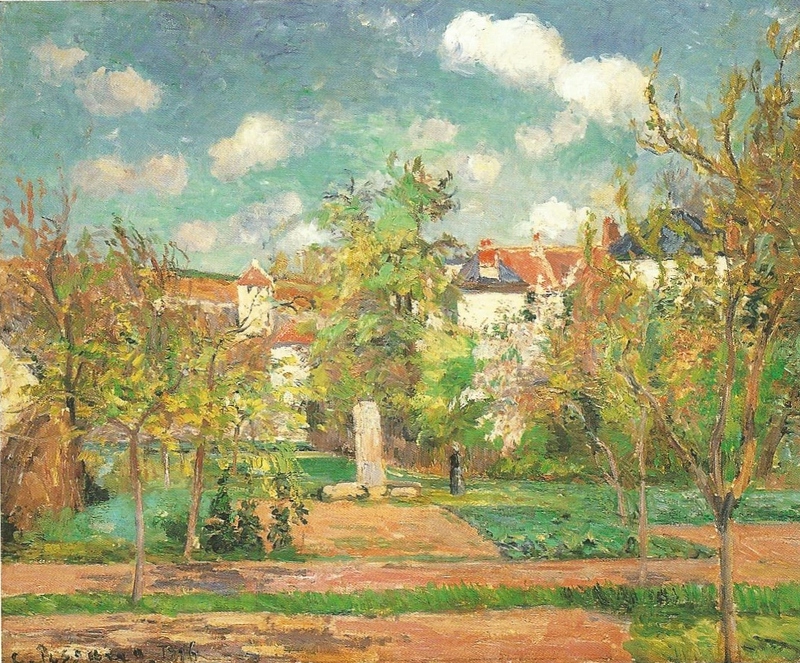 Camille Pissarro painted this garden scene in the Hermitage neighborhood of Pontoise in 1876. Even today, it seems every home in the Hermitage has its own kitchen garden or orchard stretching down the hill behind the house. It looks like Pissarro set up his easel at the bottom of the hill and allowed the roofs of the houses to describe the hill’s steep incline. The colors in the painting are a textbook example of Impressionism. The lush greens of the vegetable plots in the foreground transition to yellow green of the leaves and then to the rich turquoise of the sky. The peachy pathways reflect the red roofs on the hill. The vertical path leads us to the focal point, an upright stone with two large stones at its base. A womanin a white hat stands to the side. Rows of small trees (probably apple or pear trees) on each side lead straight back to the upright object and they are flanked by two rectangular green patches. But wait! If this is truly symmetrical, wouldn’t the focal point be in the center of the canvas? In fact, it is just to the left of center, creating an interesting tension and lifting the composition out of the ordinary. Now you can see this gorgeous Pissarro in the Barnes Foundation collection. But if you go, be aware that the Barnes REQUIRES RESERVATIONS –available by phone or online. Check their website for full information (click on the link above).